Community Spirit at Work. Together We Go Far! I have been on the Becker county United Way Board for the past several years. I am constantly Amazed with our community!! “Without you there would be No Way!! is the theme that resonated with me for this year's United Way. I see our community members taking this message and literally putting it in action to meet the needs of residents of Becker County. The “Way” is made by “YOU!”. From food for hungry children, therapy dogs for men and women who have served our Country, to Seniors who need help at home. 100% of all Contributions stay in Becker County to help people in our community in need. Without you there would be no way! 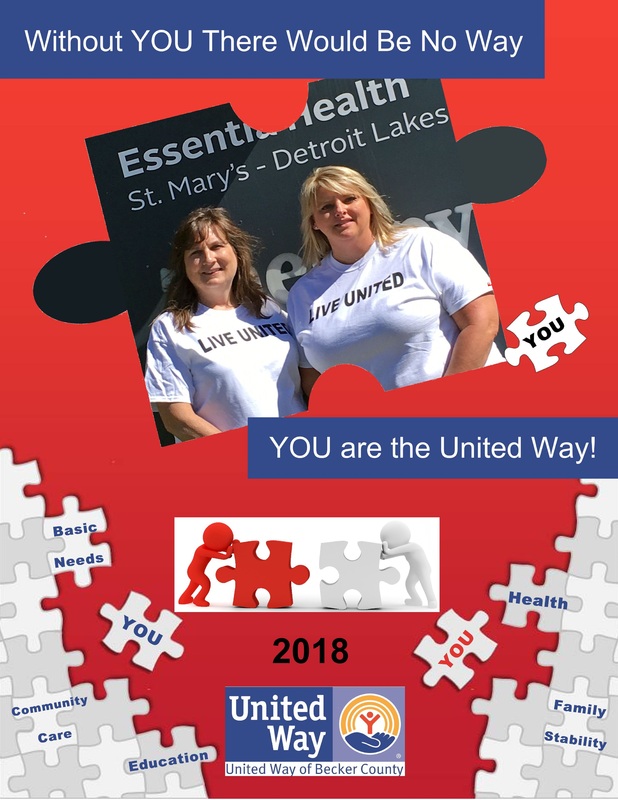 Thank you for Supporting United Way! Contributions by community businesses and employees to our annual employee payroll campaign is what helps United Way of Becker County support the agencies and organizations listed on this page. Each fall, volunteers visit the local business community to share campaign information and get people excited about Living United. If you are a business that would like to have an impact on the lives of many living in our communities, please contact us and we will be happy to meet with you. If you are a business that already participates in our annual employee payroll campaign and you are looking for resources to make this year's campaign a big hit with your employees, check out these fun flyers! You are welcome to make use of the art files to create your own posters, flyers, web, and social media promotions. We want to make it as easy as possible for you to get involved, so if there is anything else we can provide to assist you please let us know! Code of Ethics & Conduct: The United Way of Becker County is committed to maintaining the highest standards and ethical conduct in its fundraising. Please review our policy before working on any campaign.